Democratic Wisconsin Gov. Tony Evers is calling for bipartisan solutions to problems facing Wisconsin, but that appears unlikely to happen. Democratic Wisconsin Gov. 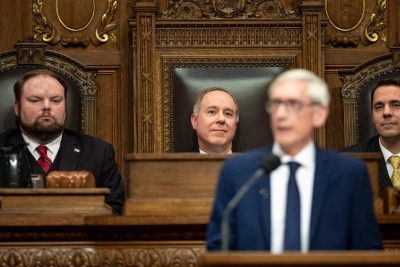 Tony Evers, in his first State of the State speech Tuesday, called on the Republican-controlled Legislature to scale back a corporate tax credit program to pay for middle class income tax cuts, "sacrifice" to find a bipartisan solution for road funding and work together to bolster spending for schools to help close the achievement gap. "The realities we face are bigger than me or any political party," Evers said in his speech as prepared for delivery. "The magnitude of our challenges requires us to put people first because, as I`ve said, that is the promise of our service." Restructure WEDC, improve reporting and access while working with all Counties to help pay a local professional as part of the WEDC team. Use tax incentives to help growing companies. Make them available to all growing companies. No new jobs no benefits. Modify TIF laws to mirror how they are actually used. Provide health care for all state and LOCAL employees including teachers. Work with power companies, business, and the legislature to create affordable renewable energy.